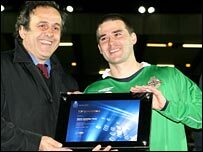 Uefa president Michel Platini has presented NI striker David Healy with a special award for scoring a record 13 goals during the Euro 2008 qualifiers. "His goal tally of 13 goals is a new record and deserves to be recognised," Platini said. "I am sure that this record will last for some time to come." French legend Platini added that Healy's new mark "will be hard to beat". "This is why I will be presenting him with a special award to celebrate his fantastic achievement." Healy, whose side narrowly missed out on qualification, described the award as a "great award". "For him to take the time out to come to Belfast to present the award is a great honour," said the Fulham forward. "It's a great honour to hold the record." The record was previously held by Davor Suker, who hit 12 goals for Croatia in Euro 96 qualification campaign. "Maybe someone will break it sometime - but hopefully it will stand for another few years," added Healy. "The hat-trick against Spain was the highlight. To score one against Spain was good but to score a hat-trick was great. "It was a hugely entertaining campaign for the players and fans alike."